At St Michael the Archangel parish, we celebrate the Byzantine Rite of the Catholic Church. Each of the twenty-four particular churches that constitute the Catholic Church is associated with a particular rite. So, for example, most Roman Catholics worship in the Roman Rite in one or other of its forms, and maintain the traditions of prayer and spirituality that have evolved in that rite, while members of the various Eastern Catholic churches celebrate the rite that they inherited from a particular Eastern patriarchate. A rite consists of the liturgical rituals and books, calendar of feasts and fasts, cycle of daily prayers and readings, and forms of administration of the sacraments, as well as the spiritual and material traditions that are proper to the rite, including forms of popular or personal prayer and physical observance (how we cross ourselves, when we stand or kneel), vestments, church architecture, and art (especially, in the context of the Eastern churches, icons). The Byzantine Rite traces its origin to the older rite of the apostolic church at Antioch. After the church in the eastern Roman capital of Constantinople (Byzantium) was elevated to the status of a patriarchate in AD 381, the rite celebrated there became standard usage throughout its jurisdiction and missionary territories, including the lands of the Kyivan Rus (Ukraine). The Byzantine Rite is, through this inheritance, the shared heritage of fourteen of the Eastern Catholic churches, as well of as the Eastern Orthodox Church. Divine Liturgy in the Byzantine Rite is celebrated in two forms. Most of the time, we celebrate the shorter Liturgy of St John Chrysostom. This important saint of the universal church was Archbishop of Constantinople AD 398–404, during which time he refined and beautified the worship of the great basilica of Hagia Sophia, and is thought to have composed the anaphora (prayer of consecration) that is the central sacramental act of the liturgy that bears his name. At specific dates in the liturgical calendar—notably during Lent and Holy Week—, the Divine Liturgy of Saint Basil the Great is normally celebrated. The rites of the Church are to be experienced: they are living traditions of faith and worship of God—Father, Son and Holy Spirit—that connect the individual and local parish community to the 'great cloud of witnesses' that have gone before us and who join in the heavenly liturgy. 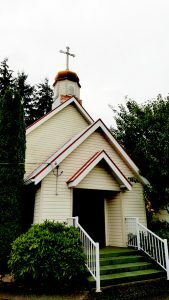 We invite you to join us at St Michael the Archanangel in Nanaimo, and to experience the Byzantine Rite.